" First time online shopping from any merchant. I must say it was a "made easy" experience." 7 Shows Plus 10-Song CD! 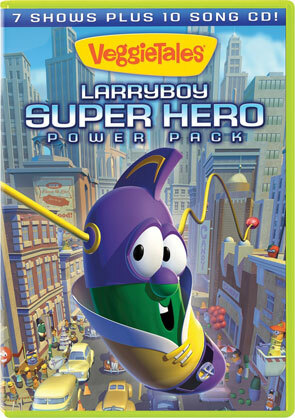 It's a super good time with VeggieTales' original superhero LarryBoy! Armed with plungers that shoot from his ears, this caped cucumber defends Bumblyburg against all kinds of tricky villains! Whether it's a rumor spreading like a weed, or a bad apple of temptation, or even an extra-terrestrial fib, LarryBoy can be counted on to save the day! Includes 7 LarryBoy shows and the LarryBoy Soundtrack on CD. Find more great movies in the VeggieTales Store! Stories about responsibility and kindness.